These commands, ripped out to hapless bank employees as they look into the muzzles of awesome revolvers, will no longer hold the old-time terror. For to be locked in a vault equipped with the new ventilation device invented by Carl W. Olson, president of the Olson Utility Equipment Corporation of Minneapolis, will not mean danger of lingering death before the time lock can be opened. Mr. Olson’s device, which can be set into operation from inside the vault in a few seconds, will insure enough live air being drawn inside and sufficient carbon dioxide to be expelled to permit a dozen persons to live in the steel prison for 24 hours without feeling any ill effects. 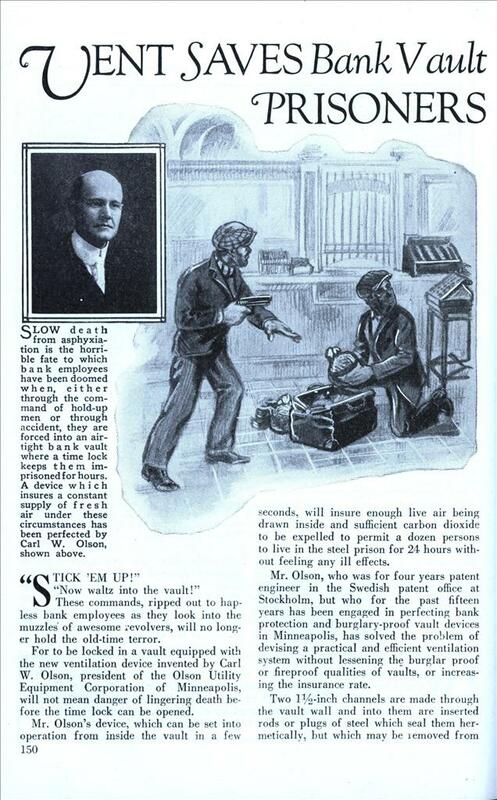 Mr. Olson, who was for four years patent engineer in the Swedish patent office at Stockholm, but who for the past fifteen years has been engaged in perfecting bank protection and burglary-proof vault devices in Minneapolis, has solved the problem of devising a practical and efficient ventilation system without lessening the burglar proof or fireproof qualities of vaults, or increasing the insurance rate. Two l^-inch channels are made through the vault wall and into them are inserted rods or plugs of steel which seal them hermetically, but which may be removed from the interior by a slight twist of the connecting levers which automatically set in motion a Zirocco type motor with a special siphonic attachment which draws in pure air from the outside through one opening and expels the impure air through the other. The rods are so firmly held in place by a special locking device when the ventilator is not in use, that they cannot be driven or twisted out of position from the exterior. I suppose this is the reason I never went into the banking business. I don’t dance. The safes could have a handle to unlock them from the inside. 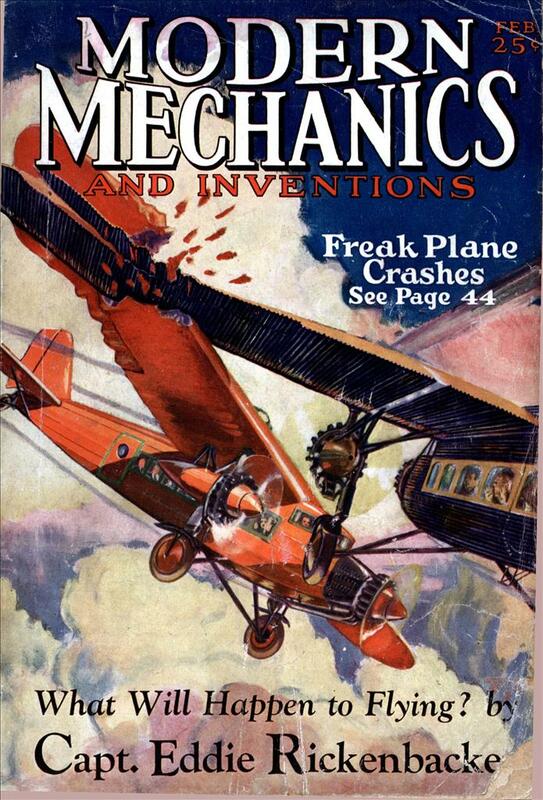 Being buried alive and trapped in a bank vault seem to be two major concerns in the 20’s and 30’s. and robots, can’t forget about the robots.